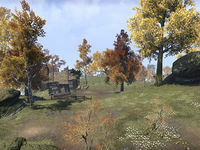 The Ebonheart Territory in Cyrodiil initially comprises the northeasternmost regions. The six keeps that make up the initial defenses of the Ebonheart Pact are all located here. In addition, the towns of Cheydinhal and Cropsford can be found in the central and southern regions, respectively. The Imperial City lies across Lake Rumare to the west, but is inaccessible. The Aldmeri Territory is separated by the Niben River to the southwest, and there are three defensible bridges that cross it. 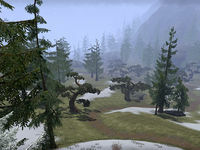 The Daggerfall Territory lies across a mountain range to the northwest, with three gated passes. 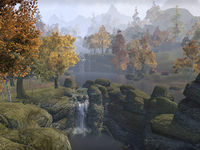 Swimming across the river or Lake Rumare is inadvisable, as they are rife with Slaughterfish. There are three Dolmens here; the Eastern Shore Dolmen and Niben Basin Dolmen are found in the west, and the Cheydinhal Foothills Dolmen is on the eastern edge of the territory. Broke Pick Ravine is situated south of Kingscrest Keep. It is a lightly wooded area on the snowline of the Jerall Mountains which contains a small lake. A road runs down the western side of the region from Kingscrest Keep towards Arrius Keep. The Cheydinhal Foothills are located south of the city of Cheydinhal, and are foothills of the Valus Mountains. The Blue Road runs along the north of the region from Blue Road Keep through Cheydinhal and towards the Gate of Ghartok. 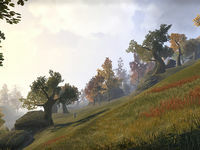 The Burned Estate and Barren Cave can be found in the western hills, just east of Blue Road Keep. Harlun's Watch and The Steed Mundus Stone are just south of the city, with Thorn Lodge and Quickwater Cave situated to the north. 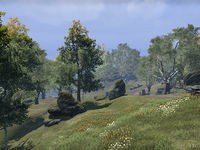 The Cheydinhal Foothills Dolmen, Scinia Ruins, and the Ayleid ruin Kemen can be found on the eastern side of the region. The Eastern Shore of Lake Rumare sits to the west of Blue Road Keep, and runs north from the Eastern Shore Dolmen to Urasek Ruins. The Red Ring Road cuts up the side of the region past Magia Ruins and a large Imperial Outpost towards Chalman Keep. 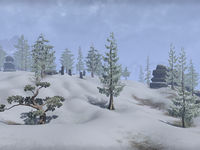 The Frost Fields are situated in the far north of the territory, north of Kingscrest Keep. The sparsely-forested region contains a number of rocky outcrops, and a destroyed dolmen can be found in the center. The Winter Gate into the Daggerfall Territory can be found in the west of the region, and a road runs from here to the Gate of Chim in the east. Horunn Pass is located west of Kingscrest Keep, and contains the Horunn Milegate into the Daggerfall Territory. The region is littered with both evergreens and deciduous trees. 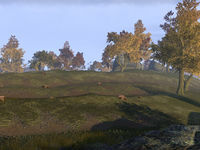 The Ayleid ruin of Sedor sits in the northern section of the region, while the Horunn Outlook looks out over Wilminn's Winery to the south. Mist Morrow Vale is a large wooded region in the east of the territory north of Drakelowe Keep. The Reed River runs down the eastern side of the region, and a tributary flows through the valley from west to east. Waterside Mine sits on the south side of this tributary. Lake Poppad can be found in the west of the region, with Muck Valley Cavern on its western shore, Vaermina's Shrine on the eastern side, and the Arvina Estate to the south. Atop the hill between Lake Poppad and the Reed River stands Crooked Finger Redoubt, which looks down over the Ayleid ruin Vahtacen. 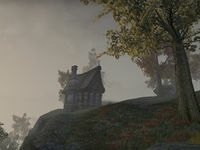 Mist Morrow Tower lies on the hill on the southern side of the vale. The Northeastern Shore of Lake Rumare is situated southwest of Chalman Keep and runs from Urasek Ruins in the south to the border with the Daggerfall Territory in the west. Lake Mist Ruins can be found on the shoreline, with an entrance to the Imperial Sewers further around to the northwest. An access road leads down to this entrance from the Red Ring Road near Chalman Lumbermill, while Thaellin's Shack can be found just inland. A bridge to the Imperial City also leaves from the northeastern shore, but it is inaccessible due to the Daedric invasion. The Northern Niben Basin is the region west of Drakelowe Keep and north of Cropsford on the eastern side of the Niben River. The region is comprised of rolling hills and wooded valleys through which the Yellow Road passes on its way from Alessia Bridge towards Drakelowe and the southeast. Agrippa Mento's House can be found on the side of the road near the entrance to Cracked Wood Cave. Northeast of the entrance, the cave roof has collapsed into a large sinkhole, which offers a second entry point to the cave. The Shadow stone is just east of this sinkhole, and the Ayleid ruin of Nornal can be found just outside Drakelowe Farm. The Niben Basin Dolmen is situated in the north of the region. 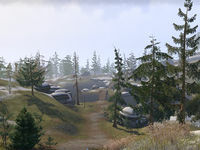 The Sejanus Hunting Grounds can be found to the east of Sejanus Outpost. 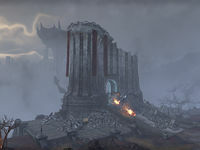 Primarily open plains, the northern part of the region has become blighted by undead spewing out of the Ayleid ruin Nagastani. 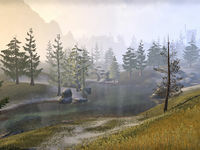 The Southeastern Shore of Lake Rumare lies to the west of Sejanus Outpost and runs from the Alessia Bridge over the Niben around to the Eastern Shore Dolmen. A small lake sits just to the south of the Magia Ruins. The Southern Niben Basin is the region southwest of Drakelowe Keep and south of Cropsford on the eastern side of the Niben River. The region is littered with rocky outcrops and tree-covered hills which lead down to the banks of the Corbolo River. A southbound road through Cropsford splits just south of the village, with the eastern spur passing Timberscar Hollow and the Hedoran Estate before dead-ending at the Corbolo next to the entrance of Newt Cave. 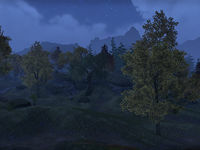 The western spur passes Crown Point and the Abandoned Homestead before crossing Niben Bridge into the Aldmeri Territory. A road leads off of this up the side of the Niben past the Ayleid ruins of Culotte to the Culotte Bridge. Summer's Pasture is located east of Chalman Keep and north of Blue Road Keep. Primarily a farming region, a number of ruined buildings can be found around the rocky crags and autumnal trees. The Ayleid ruin of Belda is situated in the south of the region, while The Ritual stone can be found in the center of the pasture. White Fall Valley lies to the north of Farragut Keep and encompasses the north and east side of the eponymous White Fall Mountain. At the northern end of the valley, just outside Kingscrest Keep, the Temple of the Ancestor Moths houses the legendary Elder Scrolls. 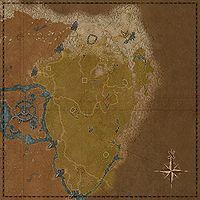 Just to the south, the road splits, with the western trail passing the Shurgak Clan Estate and The Tower stone at the foot of White Fall Mountain, and the eastern path passing Kingscrest Cavern and Fanacas before reaching Farragut. 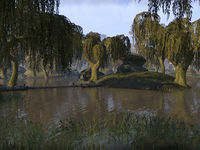 Lake Arrius can be found on the south side of the mountain in the grounds of Arrius Keep. This page was last modified on 1 January 2019, at 17:50.